PREPARATION: Take care to chop the onion fine. To keep from crying when you chop it (which is so annoying! ), I suggest you place a little bit on your head. The trouble with crying over an onion is that once the chopping gets you started and the tears begin to well up, the next thing you know you just can't stop. I don't know whether that's ever happened to you, but I have to confess it's happened to me, many times. Mama used to say it was because I was especially sensitive to onions, like my great-aunt, Tita. ‘Tita was so sensitive to onions, any time they were being chopped, they say she would just cry and cry, when she was still in my greatgrandmother's belly her sobs were so loudthat even Nancha, the cook, who was halfdeaf, could hear them easily. Once her wailing got so violent that it brought on an early labor. And before my greatgrandmother could let out a word or even a whimper, Tita made her entrance into this world, prematurely, right there on the kitchen table amid the smells of simmering noodle soup, thyme, bay leaves, and cilantro, steamed milk, garlic, and, of course, onion. ‘Tita had no need for the usual slap on the bottom, because she was already crying as she emerged, maybe that was because she knew then that it would be her lot in life to be denied marriage. The way Nancha told it, Tita was literally washed into this world on a great tide of tears that spilled over the edge of the table and flooded across the kitchen floor. That afternoon, when the uproar had subsided and the water had been dried up by the sun, Nancha swept up the residue the tears had left on the red stone floor. ‘There was enough salt to fill a ten-pound sack-it was used for cooking and lasted a long time. Thanks to her unusual birth, Tita felt a deep love for the kitchen, where she spent most of her life from the day she was born. I’m not much for cooking—my hubby is the chef in our house—but I can definitely related to Tita’s extreme reaction to onions. I’ve never heard of putting a piece of onion on your head to keep your tears away; I usually chew a piece of bread which barely works. I’ll have to try that. Or leave it to my hubs which is my custom. Anyway, so begins Esquivel’s tender tragedy, translated into English by Carol & Thomas Christensen after Esquivel had made the Spanish language movie based on her own bestselling book, Como Agua Para Chocolate. Each chapter of the novel, lauded for its magical realism, begins with a recipe for a Mexican dish which connects to the action of the narrative. A gifted cook, Tita devotes her passion to food. Earthy, magical, and utterly charming, this tale of family life in turn-of-the-century Mexico blends poignant romance and bittersweet wit. This classic love story takes place on the De la Garza ranch, as the tyrannical owner, Mama Elena, chops onions at the kitchen table in her final days of pregnancy. While still in her mother's womb, her daughter to be weeps so violently she causes an early labor, and little Tita slips out amid the spices and fixings for noodle soup. This early encounter with food soon becomes a way of life, and Tita grows up to be a master chef, using cooking to express herself and sharing recipes with readers along the way. I’m loving this somewhat outlandish story and the award winning film based on this novel. 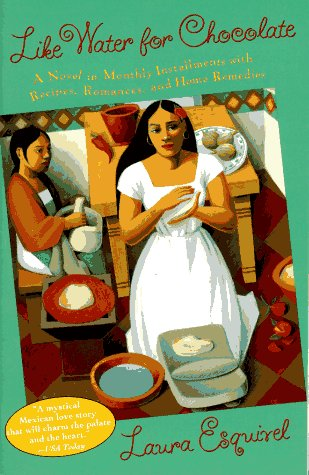 There are so many surprising images—the water rushing off the table after Tita’s birth, the passion enflamed by her cooking, her sister Gertrudis riding off naked with the revolutionary soldier—that come right off Esquivel’s pages, as passionate and steamy as the dishes from Tita’s kitchen. Not surprising, I suppose, Esquivel wrote the screenplay too. I will say the subtitles are a little large and clunky but I know some people complain they can't read subtitles. That’s not a problem here. There are no familiar names (to me) in the cast but it is beautifully made, benefitting from the cinematography by Emmanuel Lubezki. Lubezki who shot the film in 1993 has come over the years to be known for his masterful work, having been nominated for eight Oscars, winning three in the last three years (The Revenant and Birdman, both for Alejandro G. Iñárritu and Gravity for Alfonso Cuarón). Nominated for Best Foreign Film by both the Golden Globes and BAFTA, the film is a fable, often called a fairy tale of Mexican feminism, it seems to me it's a fable worth watching. 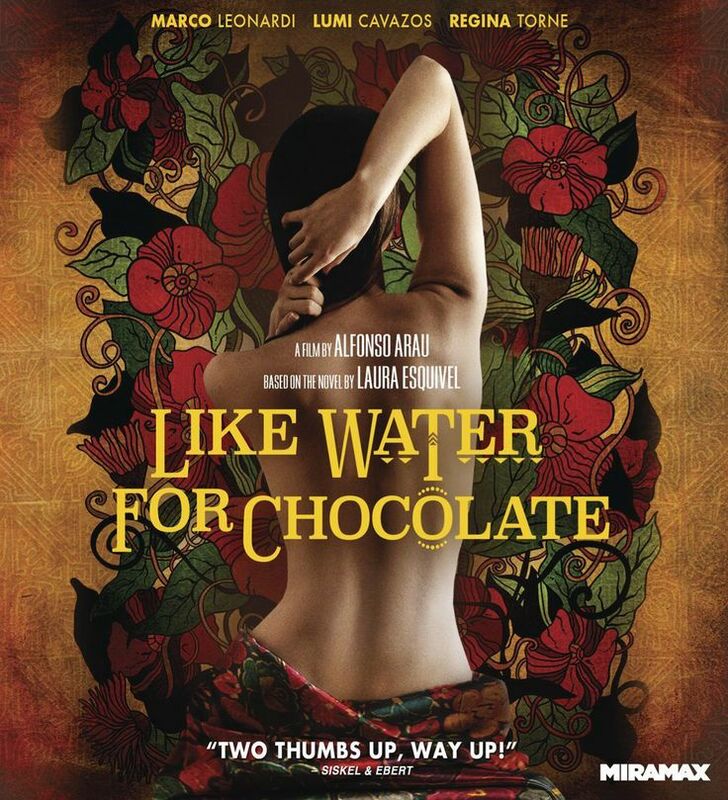 You can watch Like Water for Chocolate on Amazon, iTunes, Vudu, Google Play and YouTube. I'm streaming it on Netflix. It’s been many years since I’ve watched this, but I liked this movie despite my general distaste for magical realism. I still remember that advice about putting a bit of onion on your head when chopping onions, but I never tried it...maybe it’ll do the trick next time.